Tom Asacker writes a very thoughtful blog about marketing. Worth the read. He has a new book. You should buy it, too. What others thought about "The Business of Belief"
In this thought-provoking and entertaining book, Tom Asacker, author of Sandbox Wisdom and A Clear Eye for Branding, pulls back the curtain on the workings of the mind and reveals the hidden logic to motivating behavior, both in ourselves and in others. 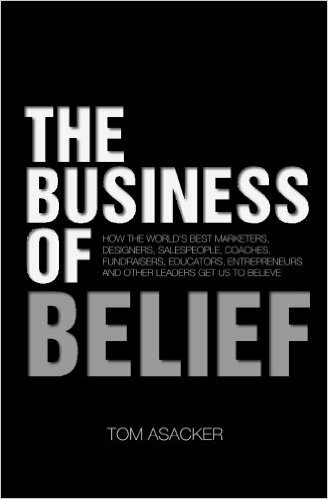 The Business of Belief is Tom Asacker's most compelling-and important-book yet. It will fundamentally change the way you think about your work and your life. Use it as your companion and as a guide in this fast-paced world overwhelmed by complexity and choice. The next big idea in business is BELIEF.